"I was runnin' through the 6 with my woes." In his 'If You're Reading This It's Too Late' song 'Know Yourself' Drake sings about running through the 6 (aka his hometown of Toronto) with his woes, and thanks to a new app you can too. 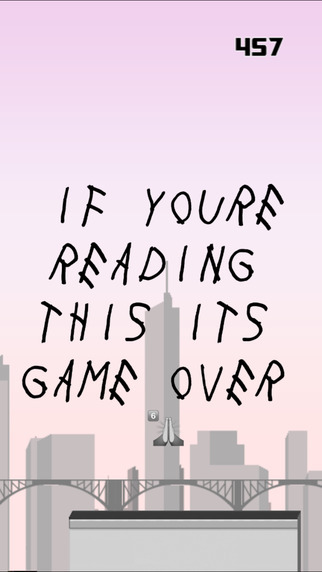 The app, called 'Runnin Through The 6,' shows an animated Drake running on the rooftops of skyscrapers. The aim of the game is to try to run through all of the '6' emojis and dodge the wheelchair emojis (which represent Drizzy's character on the TV show Degrassi) and make you unable to jump between buildings. Throughout the game messages appear written in the 'If You're Reading This It's Too Late' font, including one that tells you 'If You're Reading This It's Game Over,' when you die. Check out 'Runnin Through The 6' on iTunes.